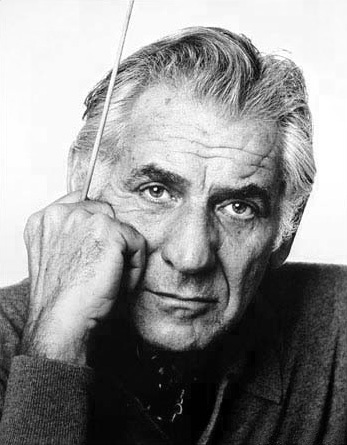 American Leonard Bernstein [1918-1990] could just as easily fall into the category "Composers' Corner," since he was as much a giant with the pen as he was with the baton. He was known primarily as the face of the New York Philharmonic and was on the podium for the American premiere of many important musical works throughout his career, including Benjamin Britten's opera Peter Grimes, plus the world premiere of Symphony No. 2 by Charles Ives. Bernstein's association with the New York Philharmonic ran from 1943 all the way until the late 1980s, and he was officially the ensemble's principal conductor from 1958 through 1969. Leonard Bernstein seated at piano, making annotations to musical score Azərbaycan: Leonard Bernstein pianinoda oturub, partiturada yazır. Español: Leonard Bernstein sentado a la piano, anotando una partitura Esperanto: Leonard Bernstein sidas ĉe piano kaj prilaboras partituron. 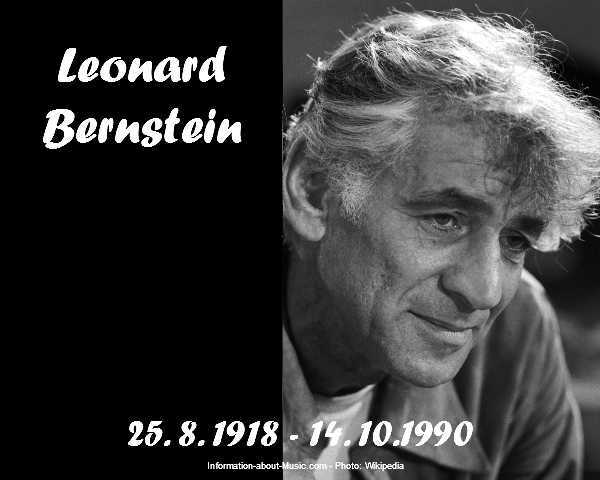 Bernstein was born in Lawrence, Massachusetts, the son of Jewish immigrants from Ukraine. He learned to play the piano at the age of 10 and attended Boston Latin School, where he met his lifelong music mentor, Helen Coates. Thanks to her careful management of his educational opportunities, Bernstein studied composition and music theory at Harvard University, following that with a year of training as a conductor at the Curtis Institute of Music in Philadelphia. Due to his asthma, Bernstein was ineligible for WWII service and therefore benefited from the lack of stateside talent the draft had caused. As a result, this relatively untested young man-he was 25 in 1943-was named assistant conductor of the New York Philharmonic. He led them semi-regularly while also conducting the New York City Center Orchestra, plus appearing as a guest conductor in the immediate post-war period with various ensembles throughout the United States and Western Europe, as well as in Israel. Bernstein's fame grew exponentially thanks to broadcasts of the series Young People's Concerts on the CBS television network. American viewers were treated to entertaining discussions of classical music, with Bernstein either at the piano or leading his orchestra through such masterpieces as Vivaldi's Four Seasons and Gustav Holst's The Planets. In all, Bernstein recorded 53 such programs that aired from 1962 to 1972 and enjoyed syndication in no fewer than 40 foreign countries. This series not only proved to be the most popular music appreciation program ever, but it gave rise to the modern-day equivalent where conductors routinely offer pre- or post-concert lectures for audience members. Bernstein was also known for making some of the first stereo records of important classical music. He led the Philharmonic in recording all nine complete Mahler symphonies, and later conducted the Vienna Philharmonic in complete sets of symphonies by Beethoven, Brahms, and Schumann. No article on Bernstein would be complete without mentioning his compositions, which remain extremely popular and an important part of late 20th century American music. While his best-known work is the Broadway musical West Side Story  (with lyrics by Stephen Sondheim), he wrote a great deal of other material for the stage that includes the musicals On the Town  and 1600 Pennsylvania Avenue , the ballet Dybbuk , the one-act opera Trouble in Tahiti  and its three-act sequel A Quiet Place , and the operetta Candide . He composed numerous orchestral works, including three symphonies, several orchestral suites, and a Concerto for Orchestra, subtitled Jubilee Games . His most popular choral work is Chichester Psalms , a Hebrew text set to music for boy soprano, chorus and orchestra. He also composed several chamber pieces, including a piano trio and a sonata for clarinet and piano. Bernstein enjoyed the acclaim of his peers and the music world in general. The London Symphony Orchestra named him its honorary president in 1987. He won 11 Emmy Awards throughout his career, as well as a Tony Award in 1969. He was given a Lifetime Achievement Grammy Award in 1985 and Kennedy Center Honors in 1980. He was an inaugural supporter of Amnesty International and, in keeping with his lifetime interest in music as a force for peace in the world, memorably led concerts on both sides of the dismantled Berlin Wall in late 1989, titled the "Berlin Celebration Concerts." The video clip that accompanies this article is Part 1 of "What is Classical Music" from his Young People's Concerts series. The original air date of this television program was January 24, 1959. Leonard Bernstein was never happy with the text to his Symphony No. 3 ("Kaddish") written to lament the death of President Kennedy. Following its 1963 debut in Israel, he believed that version of the Jewish prayer for the dead needed a stronger relationship with the Almighty. When he met Samuel Pisar, he knew he had found the perfect librettist. Pisar, the youngest survivor of Auschwitz, became an international lawyer, author, humanitarian, adviser to presidents and world leaders and recipient of many earned and honorary degrees. Following his example, two of his children currently are White House advisers. Close friend though he was of Bernstein, Pisar watched several decades pass before a national tragedy convinced him to undertake the project. When he and conductor John Axelrod first met and worked with Christoph Eschenbach to coordinate the score and Pisar's narration of his new text for its 2003 Ravinia debut in Chicago, they were like kindred spirits, two young boys in a sandbox. The only major change they made was a space added after the Tower of Babel and before the Finale to create a long interval in which Pisar gives his sermon, first a message to the world, then his personal message of optimism. Pisar has a voice like Gregory Peck and a commanding presence like the statesman he is. His tremendous ability to attract attention projects the power a rabbi, a priest or an imam might present to a congregation. The emotional text opens with an invocation to God. Haunted by his own survival, Pisar has seen his father tortured, executed and tossed into a mass grave and his mother, sister and schoolmates sent off in a cattle-train. When he was rescued by Russian and American soldiers, he was "a skeletal kid with shaved head and sunken eyes, trembling at the threshold of a Birkenau gas chamber." The lullaby, perhaps the most dramatic segment, recalls the sweet voice of his grandmother "silenced in the ovens of Treblinka." After 9/11, he knew he had to comply with Bernstein's final wish, but first he had to go back to those terrible memories, bring them to life and make every word a bomb. Technically, he had to speak totally embedded in Bernstein's complex atonal machinery. When the orchestra reaches the lullaby, the music becomes softer leading to a reconciliation with God toward "tolerance, solidarity and peace on this fragile planet." At the final word, "Amen," the audiences look stunned. They stand as if they are not going to applaud, then they burst out as if released to express what they have just felt. They know the text is authentic and they know where Pisar has been. Pisar and Axelrod, who studied with Bernstein and shared a mutual interest with him in jazz and good music of all genres, have presented this masterpiece many times with major orchestras in several countries. In September, they will appear in Moscow with the Russian National Symphony Orchestra at the invitation of the Russian government to commemorate the tenth anniversary of September 11, 2001, something Pisar never dreamed could happen.